Welcome to The Graduate School at Northwestern University. Northwestern University’s campuses are located in downtown Chicago and the attractive suburb of Evanston. Bordering both the city of Chicago and Lake Michigan, Evanston boasts the amenities of a big city in a less hectic suburban setting. Evanston is a place you'll be happy to call home, a community that shapes and is shaped by the experiences of Northwestern students. Northwestern students are presented with almost limitless opportunities for research and exploring in the city of Chicago. Chicago's museums, parks and beaches, sports, neighborhoods, and shops provide uncommonly rich possibilities for culture and entertainment. To ensure that our students take full advantage of all that Evanston and Chicago have to provide, The Graduate School offers all fulltime students access to the Chicago Transit Authority “U-Pass”, a discounted fare card for both bus and train transportation. 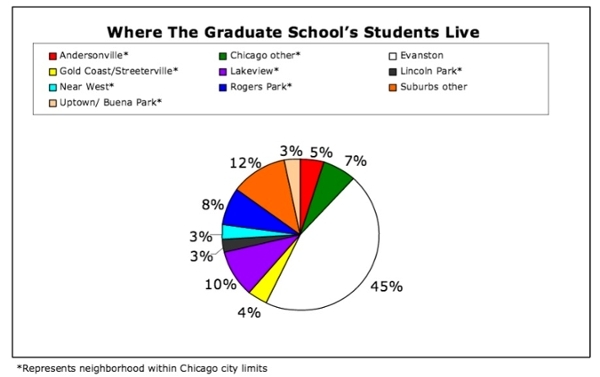 While many of our students choose to live in Evanston, others opt to live in Chicago or other suburbs. To help you decide where you would like to live during your time at Northwestern, we thought you might want to know where our current students reside. The chart below explains just that. Whether you chose to live in Evanston or in Chicago, we look forward to having you on campus very soon.